Food safety practices are critical in food preparation areas and will be an integral part of any food safety management plan. Our food safety and hygiene products provide what’s required to meet current legislation and ensure best practice, keeping your employees and customers safe. Good food safety requires that the conditions and practices carried out in a foodservice operation preserve the quality of food and prevent contamination and foodborne illnesses. Catering and hospitality businesses have a clear legal duty to make sure that food served or sold to customers is safe to eat. 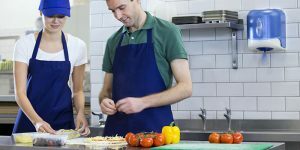 Every foodservice operator will have different risks, depending on the type of food that is prepared and the way in which it is produced and handled. A written food safety management plan and procedure which addresses those risks, based on Hazard Analysis and Critical Control Points (HACCP) principles, must be put in place, implemented and maintained. Effective food safety labelling helps caterers to maintain a systematic approach to food rotation and correct storage. 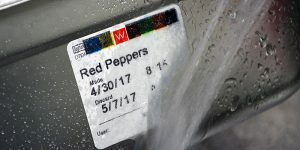 It is an important part of any food safety management plan and inspection bodies will require proof that a food safety labelling system is actively in place and in operation. Choosing the correct food safety labelling for your operation and understanding what’s required from the EU Food Information Regulations (FIR) is critical to maintaining food safety in your operation. The hot water and detergent used in commercial dishwashers will kill bacteria that could have collected on crockery, cutlery, pots, pans and equipment. However, if a dishwasher is not reaching the desired temperature of at least 71°c, the detergent may be less likely to react with the water to produce a thorough clean. It’s best practice to monitor the temperature that a dishwasher reaches to prevent missing any reduction in temperature that could cause bacteria to spread. 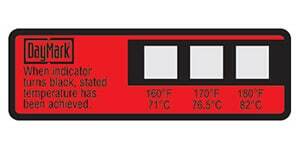 As part of our food safety and hygiene range, we provide dishwasher temperature labels and strips that provide a permanent record of the temperature achieved in a dishwasher cycle. It is important to choose the correct glove type for your employees, so that food is prepared safely and people with a latex allergy have suitable gloves available. We deliver a range of ambidextrous gloves: from lose-fitting high-volume products and gloves that are tighter fitting to prevent bacteria spreading, to products that have more fingertip sensitivity and are comfortable to wear for longer periods of time. It’s also important to wear or provide gloves that fit properly. To find the appropriate glove size, wrap a measuring tape around your hand just below the knuckles, excluding your thumb. 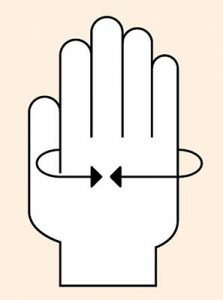 This measurement is your hand (width) glove size. For many years the first aid industry complied with the guidelines set out in the Health & Safety (HSE) First Aid Regulations Approved Code of Practice 1997. This document outlined a range of advice to employers for the provision of first aid within the workplace. New British Standards (BS 8599-1:2011) have now been issued for the provision of first aid within the workplace. 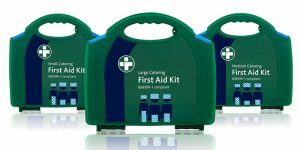 BS 8599-1:2011 first aid kits are based on the HSE first aid kits but with added extras. There are more pairs of gloves, small dressings and plasters. Other useful items such as eyewash, burn dressings, foil blankets, face shields and clothing cutters have been added. Where there are special circumstances, such as remoteness from emergency medical services, shift work or sites with several separate buildings, there might need to be more first aid kits than set out above. 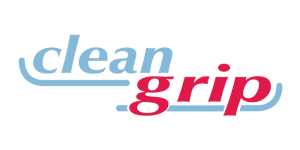 Cleangrip is a range of gloves, available in different material types, colours and sizes, to allow customers to select the glove option that’s right for their foodservice operation and employee requirements. Cleangrip Polythene gloves are an inexpensive solution for creating a barrier between bare hands and food – providing lightweight and touch sensitive protection. Cleangrip Vinyl gloves are manufactured from synthetic polyvinyl chloride (PVC), designed for short term use they are comfortable with a soft feel. Cleangrip Latex gloves offer a unique blend of comfort and puncture resistance, but for those employees who are allergic to latex, the Cleangrip range also includes a Nitrile glove as a high-quality alternative. CMC DayMark Ltd CMC DayMark Ltd, based in the United Kingdom and with distribution in the Middle East and other international markets, manufactures and provides the food service industry with efficient, economical and innovative labelling solutions, as well as food safety products and services. 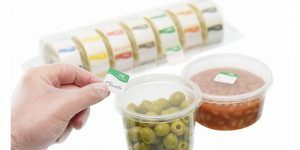 CMC DayMark revolutionized food safety labelling with the introduction of DissolveMark™dissolvable labels, MoveMark™ removable labels and ToughMark™ repositionable labels. Reliance Medical Ltd is a manufacturer of high quality first aid and medical consumables. Our focus on innovation and product design are shown in our latest releases, such as our intuitive new panel system, Spectra. Users can choose from five panels to create a bespoke and customised first aid solution, perfectly tailored to the risks identified in their workplace. 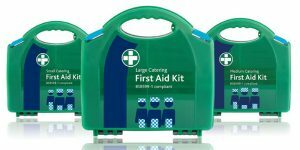 We are also the only first aid manufacturer to offer a completely blue catering first aid kit, every product inside has been dyed blue to help prevent food contamination, going far beyond the industry standard of adding blue plasters to an otherwise white kit.